And he talked about Rob Porter. 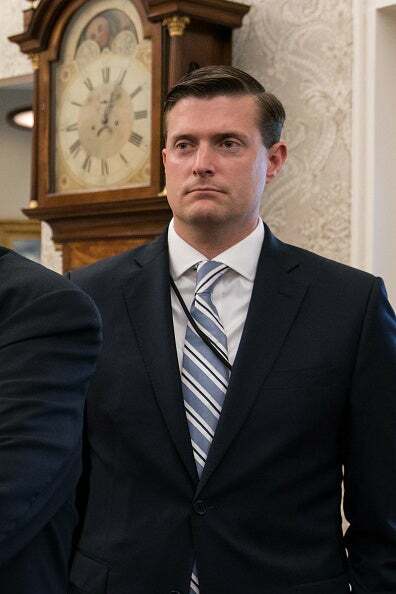 You all remember Rob Porter. You remember who this is. This is the guy that nobody knew existed. And he was apparently very important, very valuable. He was what’s called a paper pusher. But not in a derogatory way. Apparently this is the guy that went from Trump to Kelly to wherever getting things signed, agendas known and distributed, kept the trains running on time, was apparently extremely good at it. This is the kind of guy — and I remember asking those of you who have employees, do you have anybody you never have to give directions to? Do you have anybody that just knows what you want done and does it? Within the confines of their job. I don’t mean people usurping your power. I mean, loyal people that know exactly what you want done and you don’t have to tell ’em. Things very rarely go wrong, but if they do, you’re gonna get a snapdragon answer for it and an explanation. Those employees are very valuable. In fact, they’re invaluable. It’s a combination of initiative, self-starting, not waiting for direction or instruction, confidence. Those are all characteristics that are really tough to find. And not everybody has them, and particularly has all of them in one package. And replacing somebody like that is a daunting task that you don’t want to do. People in those positions in many cases can write their tickets. That’s how valuable they are. Because they take away distractions. They take away the minutia of your life or your job and allow you to focus on what it was that made you in the first place, allow you to focus on doing what you do that put you where you are in the first place. It could be paying the bills. It could be whatever. It’s stuff that you know that if they do it, it can be directing and managing other people. Whatever it is, you know it’s gonna get done. If there’s a link in the chain that’s weak, it’s not this particular guy. Well, apparently that’s what Rob Porter was. That’s what he was to Trump. It’s what he was to Hope Hicks. It’s what he was to the chief of staff. And so when the allegations came from two of his ex-wives that he had beaten ’em up and abused them, they didn’t want to believe it. ‘Cause if any of that’s true the guy’s gotta go. And Kelly is apparently still being raked over the coals for not reacting immediately by getting rid of the guy when his two ex-wives spoke up. And Kelly, I guess he met the press today or issued some written responses, I’m not sure what; but when this came up, he said (paraphrasing), “Look. He denied it. The first time I asked him about it, he denied it. And this is not a guy that ever lied to us. He denied it. He said his two ex-wives are making it up. It wasn’t true. I got nothing to apologize for. I got nothing to resign for,” Kelly said. So it later was established that it’s gonna be very, very hard to defend the guy and he had to go. They didn’t want him to go, and it’s simply because of his value to them. It’s not personal. It’s not that they were defending or taking up the side of a guy that mistreats women, mistreated his ex-wives, believe me, it’s not that. They don’t want to have to try to replace the guy. People like this are very, very hard to replace because people like that are very unique. Fundamental in this kind of guy is somebody you never worry is trying to take your job, either, is never trying to ace you out, never trying to undermine you. These people are really rare, that they have every characteristic you need, unquestionable loyalty and supreme confidence. And it’s not that they can read your mind. Nobody can do that, except husbands are expected to. (laughing) Slap me. It is that they learn fast on the job and the experience teaches them what their boss wants done and how and they just do it. So they didn’t want to get rid of the guy. And Hope Hicks apparently was dating him. And they don’t think Hope Hicks dates abusers. I mean, none of this made any sense to ’em. But then I guess they learned the incontrovertible truth that the guy was or had been very abusive, two ex-wives, and is gone. And so that’s all part of the chaos in the White House. I got some emails during the break, “Mr. Limbaugh, are you denying these stories of chaos?” Well, I’m not in a position to deny them. I’m just telling you I don’t believe it’s to the extent being reported, because most of it doesn’t make sense. Most of it is contradictory. The real story here is what has always been the story from the first day Trump was inaugurated and that is who is leaking this stuff? Who is calling the media and telling them this stuff? “Well, you don’t know. These guys take these jobs. They try to parlay them into personal advancements.” That’s above my pay grade. I couldn’t imagine taking a job like this and first thing wanting to do is undermine the guy that gave it to me. But, see, I’m not a Washington denizen. I don’t live in that world, and so my advancement in life or career is not based on doing it in that town and going through the steps, the recipe that you have to take. Believe me, the media runs that town, left-wing socialism runs that town socially and professionally, and if you want to matter, you’ve gotta kowtow to ’em. So, yes, I think a lot of this chaos is being amplified and made up, and I think it’s coordinated. And I think much of it is because Mueller doesn’t have anything. Mueller still doesn’t have anything on the original reason for his being impaneled as special counsel. And that’s collusion with Russia.